It's almost football season, and Avery has been gifted several A&M outfits. She is lacking in the Ole Miss department, so I tried to do a quick repurposed dress for her out of one of Todd's tshirts and a plain onesie. Unfortunately, I didn't have enough room on Todd's shirt to make the dress wide enough. It's way too tight, but at least we got in a few good pictures. Here's Daddy with his little Rebel fan. By the way, the start of football season is extremely significant in our household. It means a time of joy for Todd with a few frowns from me. At least this year, I can count on a babysitter as long as he doesn't have to leave the couch much. Gig'em Aggies, and Go Rebels!!!! 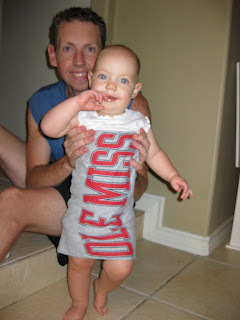 I bet it won't take long for Ole Miss fans to provide this little Rebel with a collegiate fall wardrobe!